In 356 B.C., a son and heir, who was to become one of history’s greatest logisticians, was born to King Philip of Macedonia. At age 16, Alexander was already a general in the select army. At age 20, a murderer’s knife elevated him to the throne. Quickly, he built his reputation, striking fear into the hearts of those who dared oppose him. He ruled, conquered, and assimilated countries – including Greece, Persia, and India – into his domain for a short 13 years until his death in 323 B.C. These same factors can make any organization successful in today’s complex business environment. There are many striking parallels between Alexander’s ancient organization (the Macedonian army) and today’s modern company doing battle in the marketplace. This article examines Alexander’s implementation of logistics principles and how these same principles can be applied today. At the most basic level, Alexander was able to perform his legendary feats because he included logistics and supply-chain management into his strategic plans, as any company should do to maintain a competitive edge. For example, he timed his army’s departure so the 30-day supply of rations carried by sea transport would last until 10 days after harvest at the first destination city, which provided a seamless supply of food and water for his men until the conquered city could provide them with additional supplies. Ironically, despite today’s complex business environment, most boardrooms still do not give proper consideration to the logistics side of doing business, primarily because its function has traditionally been viewed more as a cost of doing business. 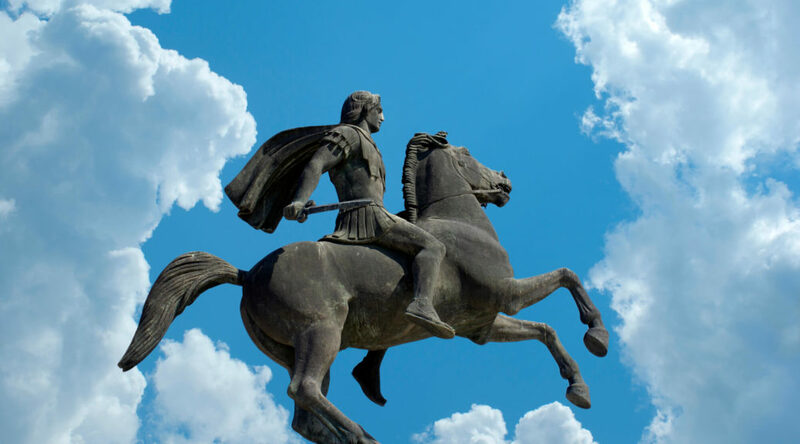 Logistics professionals in many companies today have failed to educate their executives on how proper logistics management can add value – a fact on which Alexander the Great based his achievements centuries ago. Through careful logistics planning, Nalco Chemical Company was able to develop an innovative method of delivering chemical products to its customers, who previously were having problems with their packaging and experiencing chemical spills during delivery. Nalco’s engineers studied the problems and developed a returnable stainless steel container that completely changed the manner in which chemicals were delivered. Called a Porta-Feed, the container eliminated dangerous and time-consuming handling on the part of the customer, as well as the costs of waste disposal. Nalco’s executives had to strike a balance between any doubts they had and the analytical vision that presented itself. They had to act with a degree of intuition and agree to include logistics in strategic and resource planning. Although the decision to market was made without benefit of quantification, the end result was a strong competitive advantage and return on investment. Another example is Nortek, where a $600 million division struggled with a complicated supply chain. They managed over 26 high end home audio brands and product lines. They had a high mix / low volume demand pattern with significant demand variation and long (4-6 month) lead times from the China suppliers. Their inventory was growing and their ability to fill orders stagnated. It is hard enough to forecast next month’s demand, let alone demand in 4-6 months (due to their lead time). They did address this, but it was not through complex systems enhancements or beating on their supplier base. Instead, they committed to core suppliers, provided them with rolling forecasts and actual weekly demand. This enabled them to effectively reduce their lead time from 4-6 months to less than 6 weeks. They set up a pulse, enabling their suppliers to resupply provisions on a planned schedule, modified by actual recent demand. Another well-known example is Amazon. They have set up a logistics approach that enables them to deliver product to customers in a way that brick and mortar stores and even other e-tailers can not mimic. Amazon is less than 25 years old and it controls almost 5% of the US retail market. In the area of limited benchmarking Alexander was, in many ways, best in class. He could not always follow a similar organization’s pattern of success, but could instead rely on his knowledge-based intuition. Benchmarking, while a good tool to use, is not reliable when developing innovative solutions. Organizations must continually challenge their world view and themselves to meet changing business demands. Alexander did not rely solely on process knowledge or on technical knowledge about his competition or the terrain, but rather combined both to develop a strategy that allowed him to meet a specific need. He rarely, if ever, lost a battle. Both Amazon and Nalco are companies that have taken the same approach. In a military scenario devoid of computer tools and mechanized weapons, technology primarily refers to weapons. Alexander’s father, King Philip, invented a new weapon called a sarissa, which was essentially a 20-foot lance. Alexander used this new weapon (technology) to his advantage, and the men in the rear rows of the army’s phalanx wielded the sarissas to provide protection to the front rows of the infantry. Unfortunately, many companies use current weapons (business tools) to their detriment. The complex and rapidly changing business environment provides more options among technological tools and services. If not properly utilized, any of them can drain a company’s financial and mental resources. Today’s challenge to business is to prudently choose weapons and fully exploit them to meet specific logistics requirements. In our modern times, new technology weapons, such as non-digital devices connecting to the Internet of Things (IoT), allow businesses to gather supply chain data instantaneously. With the emerging blockchain capabilities to transfer data between manufacturers and suppliers, delays can be mitigated because data transparency reveals any issues in the supply chain as they occur, which can only improve business relationships. Whether the weapon is a sarissa or the latest inventory control technique, effective integration of information technology is critical to success. In addition, to be as effective as Alexander the Great, the resources of allies must be used. Like Alexander, most great logisticians understand that while knowledge-based decision making and empowerment can be relegated up to a point, there ultimately must be a single point of control, a place where the buck stops, a CEO, who is held accountable. Alexander made the decisions for his army. He was the central point of control, he managed the logistics system, an incorporated it into the strategic plan. While modern CEOs should not personally run the logistics management function, they should appoint someone to run this critical area. This person should think like and report to the CEO. In addition to having the ability to effectively marshal forces, a leader with authority over all aspects of logistics can help a company avoid the disjointed style of operation that leads so many organizations to mediocrity. Today’s challenge to business is to prudently choose weapons and fully exploit them to meet specific logistics requirements. Today, more than ever, a single point of control is necessary to maintain a clear vision for an organization involved in logistics management. For example, many widely accepted business practices, such as Lean Manufacturing, cross functional teams, quality systems and process management optimize portions of a company’s existing operations while implementing ways to improve upon them. Too often, however, the optimization of one task or sub-function is completed at the expense of another. Although Alexander personally led the logistics organization of his army and included it in strategic planning, this does not mean logistics operated in a functional silo. Rather, much like today’s advanced corporation, Alexander’s decision-making process involved cross-functional information sharing. Like Alexander the Great and his organization, a modern company cannot be fully effective and productive if bits and pieces of its infrastructure are managed by different people sharing disparate philosophies and with no shared culture or central point of contact and control. Effective logistics management processes today are largely a function of having cross-functional, shared information with a single point of control. In organizations where purchasing, shipping, receiving, traffic, production planning, forecasting, and customer service do not report to one person with an overall responsibility for supply-chain management, opportunities for creating increased cost and service efficiencies will fall through the cracks. Alexander the Great was so named not because of his physical stature, but because of his philosophies, strategic planning, and accomplishments. His unification of much of the civilized world made the later Hellenistic period possible and provided an example for organizational excellence for millennia to follow. The ProAction Group would be happy to review your needs and assist you in leveraging the logistics lessons learned from Alexander the Great. Please contact us here. If you enjoyed this article, please consider joining our email list so you never miss a post.